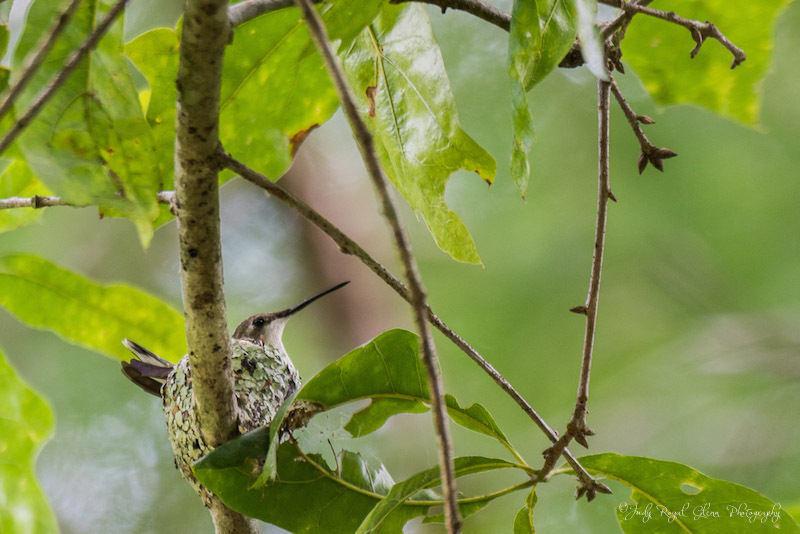 Silly Hummingbird Baby—That's Not A Flower! "Silly Hummingbird Baby—That's Not A Flower!" Some more baby hummingbird fun! 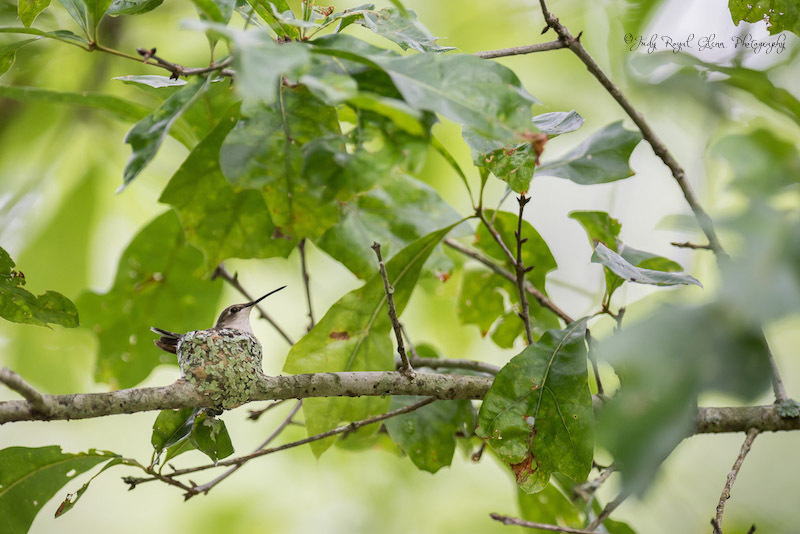 This photo is a clip from a video of a ruby-throated baby hummingbird out of his nest, on a branch and licking it! Video shot the day he fledged on June 25, 2015. 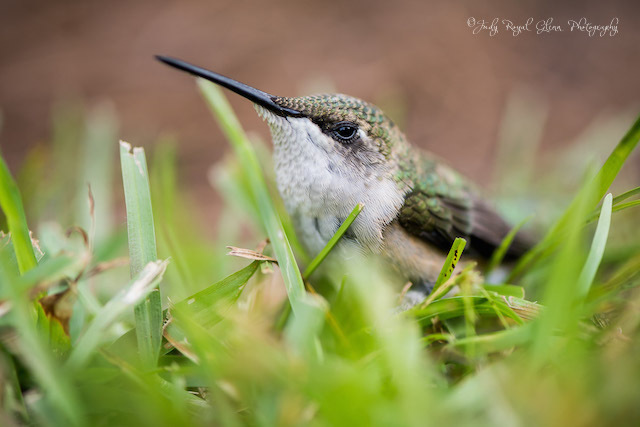 For the last three weeks I have been immersed in photographing the baby ruby-throated hummingbirds at the State Botanical Garden of Georgia. I did not want to bore everyone with every blog being about the hummingbirds, so I thought I would change up the scenery for today. I found this reddish egret on the beach at St.Simons Island, Georgia. I love the leading lines of the sand and water in this photograph. I termed myself "modern day Noah" yesterday. Yesterday was the best day of nature photography for me ever! I have been showing visitors to the Garden the nest and the babies through the back of my lens. Sue and Janet were two such people that witnessed the amazing view. 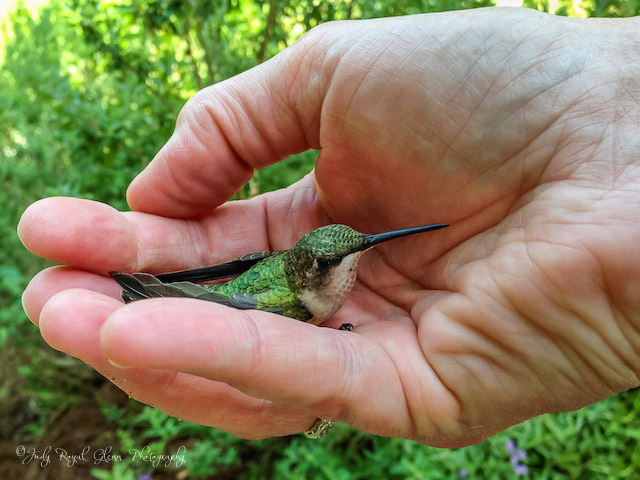 A little while later, one of them asked me to come quickly because there was a hurt baby hummingbird on the ground. When I arrived, the hummingbird was on its feet standing on the concrete, but his wing was sticking out to the side. We assessed he probably flew into the glass windows of the Conservatorium. He could have either been hurt or just stunned and needed to collect himself. I picked him up off the hot concrete and placed him in the shade at the edge of the grass. I knew I would probably never get this opportunity again. Being a wildlife and nature photographer, I began photographing him. 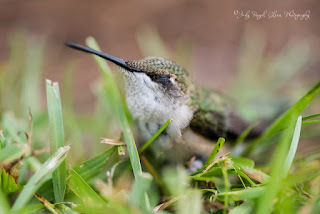 The hummingbird was breathing very heavy and moved with each breath it took. He mainly kept his eyes closed, but once in a while opened them. After about five minutes, his breathing was normal, and he started to be more alert. I asked for permission to break off a flower to see if he would feed, but he just needed to sit. A little while later, off he flew to the top of a tree. I was thankful he was all right. Just this week, I found the tiniest baby fawn who I thought may be dead when I found him. 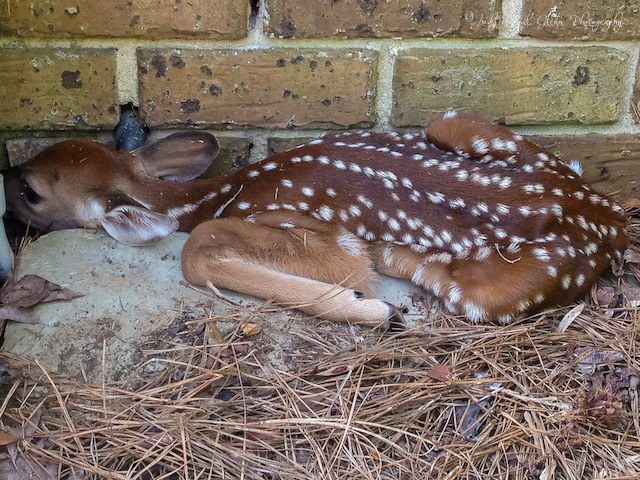 I was sweeping the front porch, and he was next to the house with its nose pressed in the corner. Not knowing whether they drink anything but from their mother, I did not know if it was dehydrated and picked it up to give it a drink. It refused and scampered into the bushes. "Modern day Noah" is a silly but fitting name for me. I pray and ask the Lord to show me or bring to me what He wants me to photograph. He answers my prayers all the time. He also uses other people such as Sue and Carol in this endeavor. 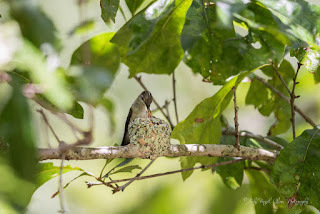 When I took a group of visitors through the hummingbird trail, a momma hummingbird greeted us as she hovered in an oak tree. Or He uses Pat, one of the visitors with us, who spotted her sitting on her nest right in front of us! 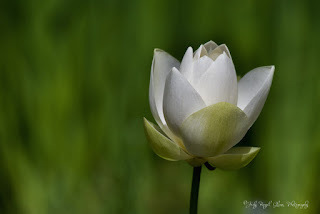 While I was at the State Botanical Garden yesterday, I noticed a water lotus flower standing about four feet out of the water. I have never seen this type of flower so tall. It was beautiful and even though I was tired and heading home, I had to stop to photograph it. Nature—it's addicting!! I wasn't planning on posting a hummingbird photo today until I captured this photograph this morning at the State Botanical Garden of Georgia. I had to share this incredible sight. 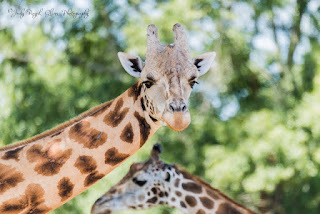 One day I will go on a photography safari to Africa. Until then, I will visit the Wild Animal Safari in Pine Mountain, Georgia. At least I can hand-feed and touch them here! 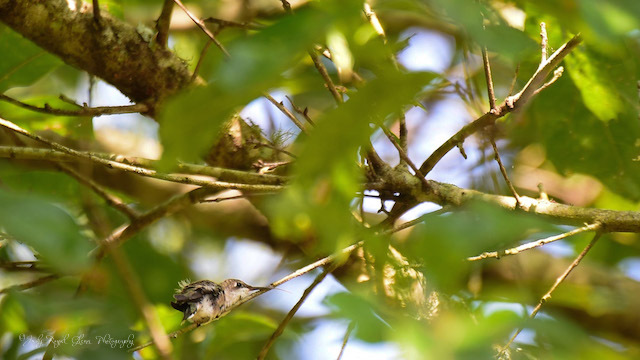 This photograph captures Faith, the momma ruby-throated hummingbird, feeding her babies at the State Botanical Garden of Georgia. This photo was taken June 12, 2015. From what I can tell, she has two babies. They are about six days old. I don't know the exact day they hatched. Their beaks are starting to get longer. 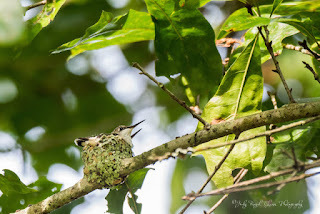 I am so excited to introduce everyone to Faith, a momma ruby-throated hummingbird, at the State Botanical Garden of Georgia in Athens. Wow, what a day it has been! I was able to video Faith, our ruby-throated hummingbird, flying up to her nest and then feeding her babies. The babies are tiny right now but they can be seen on the video a little as she feeds them. A little background story: I researched and designed the Hummingbird Trail at the State botanical Garden of Georgia which opened in 2014. Friday, I spoke to a group of people about hummingbirds for Friends First Friday. When the presentation was over, I took a group of people out to view the Hummingbird Trail. A hummingbird hovering in the tree greeted us. One of the attendees noticed her lay on her nest. Today, I met with the Lee and A.J. from the Athens Banner-Herald. An article will be in the paper June 10, 2015. While we were there, quite a few people were coming out to see Faith. The word is getting around! I will also be posting photographs of the babies when they get big enough. 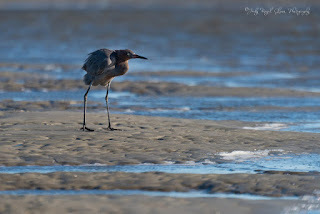 Follow and "like" my Facebook photography page to see those photos! My YouTube video of Faith feeding her babies. I spoke Friday at the State Botanical Garden of Georgia about hummingbirds for the Friends First Friday. I then led a group of the attendees through the Hummingbird Trail. We were greeted by a hummingbird at marker #1. She hovered amongst the oak tree. Pat, one of the attendees, noticed she then lay down on her nest!!! I was speechless! They typically build their nests 10-50 feet in a tree, and their nests are the size of a walnut! 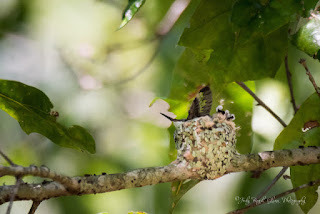 Never thought I would see a hummingbird nest! I can't wait to take photos of her babies! I am saving my favorite shot for my blog in a few weeks. I am sure I will take TONS more. I named her Faith and her two babies will probably be Hope and Joy!